Thanks very much to my lovely loyal customer Beth Ann, who asked me recently for advice about hat storage. It was a great question, so I thought I'd share it with everybody. Beth Ann has a growing collection of House of Nines Design hats, and wrote in "I love hatboxes, but they take up so much space. What would you recommend for hat storage in a small apartment? A hatstand? Do they still make those?" Living in a small apartment, myself, I feel Beth Ann's pain. Displaying hats temporarily on stands or pegs is ok, but I don't recommend storing hats that way for more than a few days at a time. I have stands to use in my studio, but the hats are only on them for a short time before shipping out. The problem with stands is that they usually have a part that protrudes up into the crown of the hat, so the weight of the whole hat is pulling at the top of the hat from the inside. Fabric or knitted hats can take this treatment without a problem, but felt hats are not designed for it. The weight of the hat should rest on the brim, not on the inside of the crown, or the shape can be distorted. Stands with hard pegs are the worst, but even padded stands can cause damage. Mannequin heads are fantastic, in terms of being the right shape for your hat to rest on, but hats can get faded and dusty from being exposed to sunlight and in the open air for a long time. 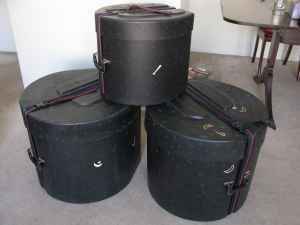 Even though the drum cases are large, they take up less total storage space than if each hat is packed in its own box individually. I like the 18x18x18 inch size, but they come in different sizes, and they're stackable. They also travel well, I've taken mine all over by airplane with no problem. You may be able to find them locally at a music instrument store, or maybe used on craigslist, etc. If you'd like to purchase one through me, contact me for pricing info. You could also search online for large cardboard hat boxes. These usually measure about 13x13x13 inches, and I can fit about two full size hats, or three mini top hats, per box (just for reference). They're readily available online through sites that sell vintage stuff, like Etsy and Ebay. 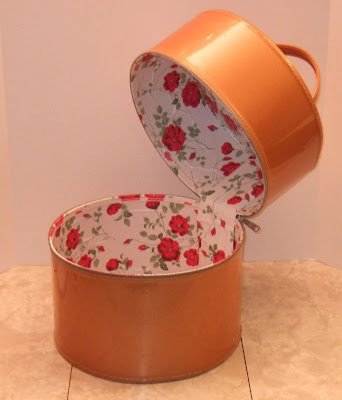 They're stackable, and the handles are nice. They're great for car travel, but not for air travel, as they're not strong enough to survive as checked baggage but they're too big for carry-on. You can get some good deals if you search around, I try to never pay more than $20 per vintage wig box. If you get this kind of box, be really careful not to catch the hats, especially veiling, in the zipper as you close it. I don't recommend stacking hats without padding between them, or packing hats inside of other hats for storage. 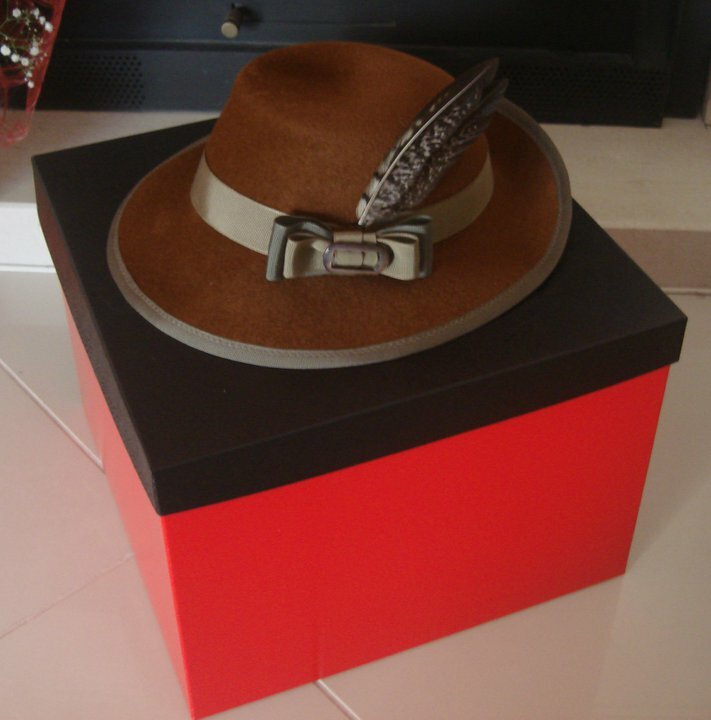 Instead, pack your hats one at a time into the box with plain white tissue paper (the gift kind, not Kleenex), so the hats are not touching or denting each other. The best thing is to lightly crumple big sheets of tissue paper, separated so you're only handling one sheet at a time. Scrunch the sheets a bit, but don't smash them so much that you lose the natural stiffness of the paper, as that's what will provide support for the hats. You want to make crinkled sheets, not hard, wadded-up balls, which can also damage the hats. Put down an inch or two of tissue at the bottom of the box, then gently pack each hat in with more tissue so the hat is supported on all sides. Place only one sheet in at a time. I try to have about two inches of tissue between each hat, and an inch or so of tissue padding around the entire inside of the box so the hats don't rub against the box. Pack it *lightly*, not tightly. You want the hats to kind of float in there in a cloud of tissue, so they're not getting dented or smashed, and to only use as much tissue as you actually need, so you're not adding extra weight. If you're packing hats for travel, fill the box to the top with crinkled sheets of tissue so the hats won't bang around inside. And the hats should be sitting upright in the box if possible. Think about placing the sturdiest hats toward the bottom, and more fragile hats toward the top, as the ones at the bottom will have the most weight on top of them. Remove feathers if possible before packing them, so the feathers don't get bent and also because the hats will take up less space that way, and as you pack, be sure that any ribbonwork on the hats is being gently supported by tissue, but not getting crushed or folded in weird ways. House of Nines Design hats are little sculptures, they're fragile and should be handled and stored carefully. Proper packing and storage can help keep your hats in great shape for many years to come. Thanks again to Beth Ann for sending in this great question. If anybody else has questions about hat care, ask away, I'd be happy to offer any advice I can.